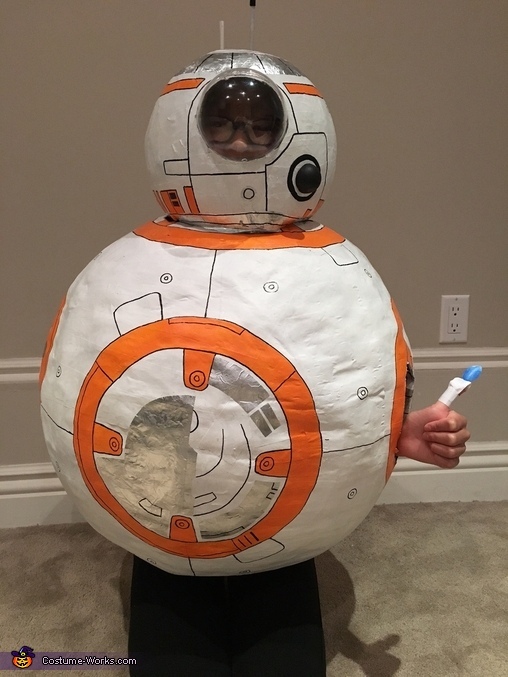 This homemade costume for adults entered our 2016 Halloween Costume Contest. Abigail Cheng designed and created this costume. She is wearing it in the picture. I really liked the Star Wars movie the Force Awakens, and was inspired to portray my favorite character, BB8. Also, I had some experience with paper mache and wanted to use that knowledge to create a costume that had some shape. I paper mached around a yoga ball for the body, and paper mached around a beach ball for the head shape. I then drew the details and painted the body. I cut aluminum foil for the metal parts on all of the circles. I also cut a hole in the head shape and taped a DIY ornament in for the lens. For the second lens, I also cut a small rubber ball in half and painted it.